Confidence is the most attractive quality a person can have. While they say confidence comes from within, being the best version of ourselves outwardly doesn’t hurt! 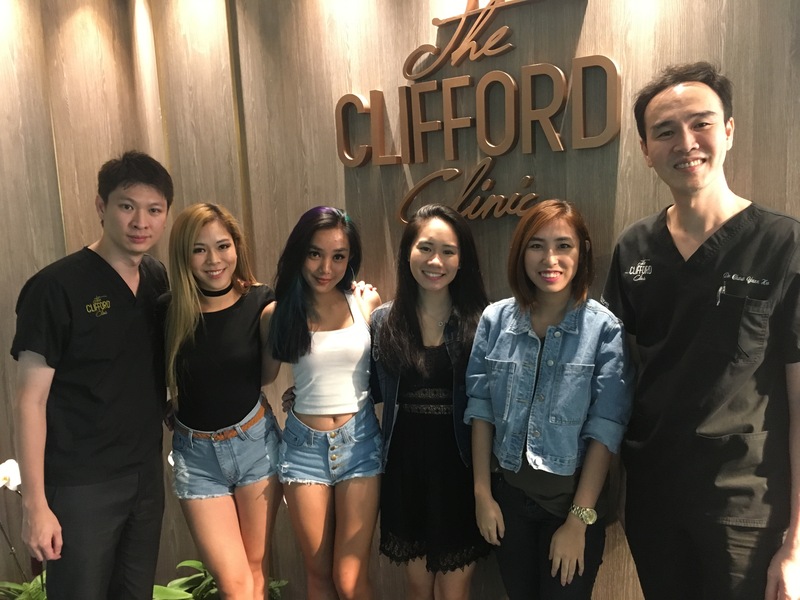 This month, DiscoverSG ambassadors Shivon, Diana and Kimberley made a trip to The Clifford Clinic to better understand their skin and learn how they can address their various skin concerns. With over 15 years of experience in Aesthetic Medicine, the doctors at The Clifford Clinic assure that you are in skillful hands, and that you will receive nothing less than services of the highest quality. The Clifford Clinic strongly believes in carrying out minimally invasive aesthetic procedures, striving to deliver natural-looking results with little to no downtime. This means you can get back to your daily routine in no time at all! 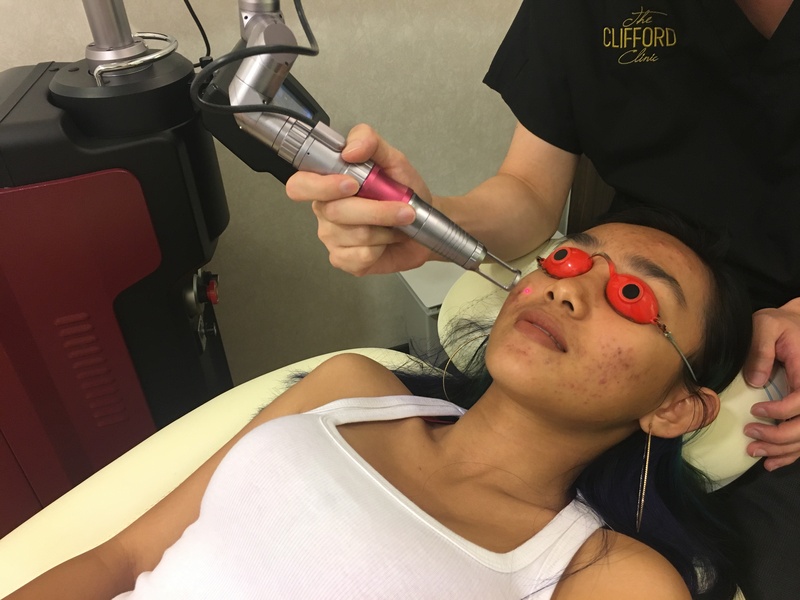 Dr Gerard Ee, the main aesthetics doctor at The Clifford Clinic, examined our ambassadors’ skin and recommended the best treatment for them, based on their different skin concerns. 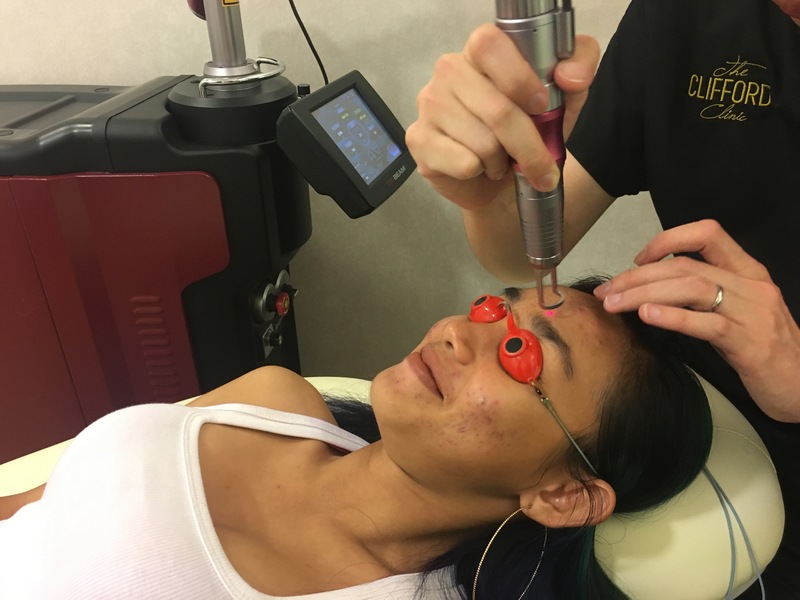 Diana tried the Q Switch Laser Treatment while Shivon tried the VBeam Laser Treatment. The Q Switch Laser Treatment is a safe and effective laser treatment with no down time or discomfort. It helps with the rejuvenation of your skin, treating conditions such as wrinkles, acne, acne scars, large pores, pigmentation, and spider veins. It can even remove tattoos and birthmarks! 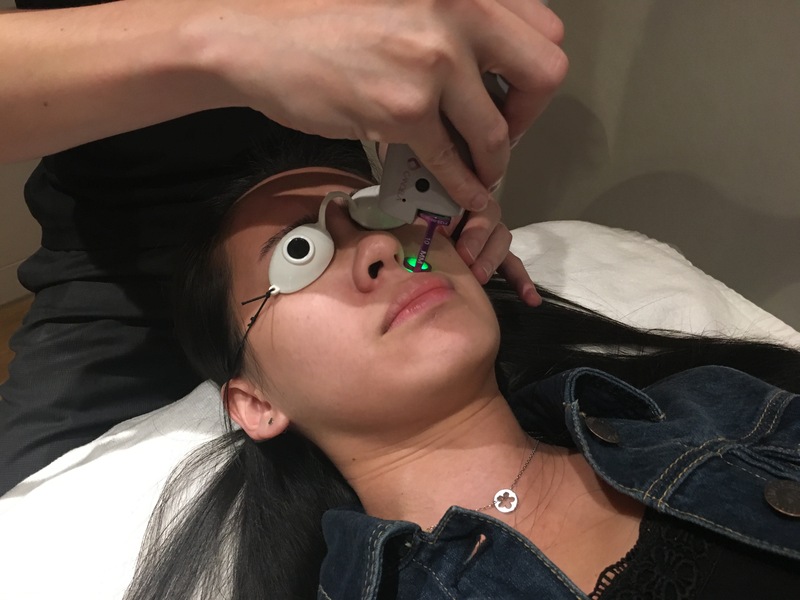 Due to her acne concerns, Diana had a go at the Q Switch Laser Treatment. According to Dr Ee, Q Switch is one of the most technologically advanced lasers. It is FDA approved and clinically proven to work for the removal of both superficial and deep hyperpigmentation lesions. Dr Ee explained that the number of sessions needed vary from person to person. Nevertheless, the skin should look finer, smoother, brighter and clearer after about 3 to 4 weeks of this 15-min procedure! Other long term benefits of this procedure include reduced damage from sun exposure as well as boosting of the skin’s collagen and elastin levels. Let’s move on to Shivon’s experience! Her primary concern was the red pigmentation at the sides of her nose. Dr Ee explained that these were broken capillaries (tiny broken veins) that caused a persistent redness and that could also be a sign of ageing. The VBeam Laser Treatment is done with a pulsed-dye laser, with long pulses of bursts of light onto the skin. While the bursts of light are intense, they are gentle on the skin. The long pulses deliver laser energy to targeted blood vessels without adversely affecting the surrounding tissue. The treated blood vessels are then gradually absorbed by the body during the body’s natural healing process. 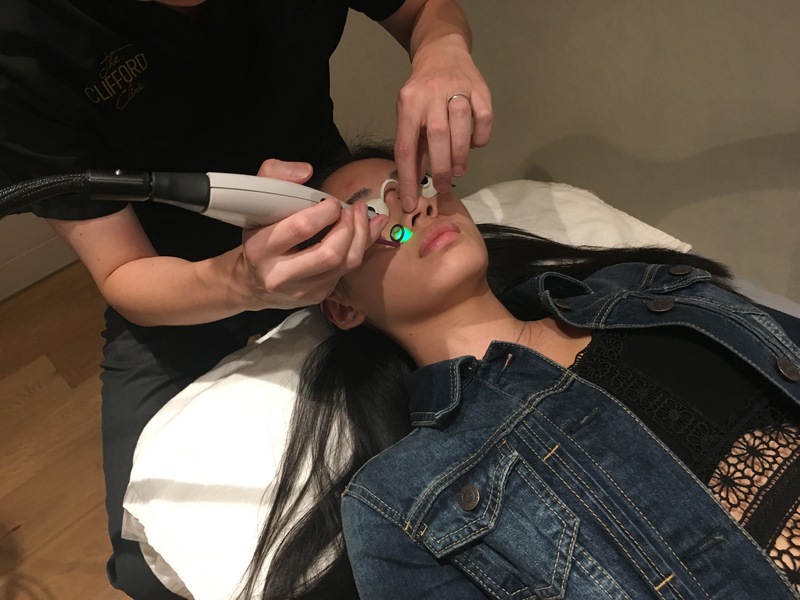 Dr Ee shared that the Vbeam laser is extremely safe and effective, and has even been used successfully on infants and children with more delicate skin. It can treat skin concerns such as broken capillaries, acne scars, spider veins on the leg, stretch marks and Rosacea. Overall, our visit to The Clifford Clinic was pleasant and enriching. Dr Ee was thorough in his explanation of each treatment, how they work, and their benefits. The clinic only uses state of the art equipment along with the best skincare products. With that, plus the attentive care and professionalism from the doctors, you can be rest assured that you will receive the most effective and comfortable treatment your skin needs!